With the start of school come hectic mornings, overflowing schedules, packed lunches and quick dinners. It’s hard to maintain a healthy diet through the busy fall and winter months, and dinner bears the brunt—unless you find clever ways to incorporate veggies into breakfast. For many, breakfast is heavy on carbs and sugar and lunch is on-the-go, leaving dinner our main source of vegetables. Making from-scratch meals on a budget and tight schedule is hard enough without also having to ensure that everyone eats a cup (or more!) of veggies with dinner. That’s a lot, which can be especially hard for little ones who are tired and less open to new or their least favorite foods at the end of the day. Serving vegetables at breakfast helps alleviate the already tremendous pressure that mounts during dinnertime and helps make sure that kiddo gets everything he needs over the course of his day—at least when it comes to veggies! Vegetables at breakfast sound daunting? It’s easier than you think—these 6 ideas are proof. Roasted sweet potatoes are shockingly delicious. Dare I say, as sweet as candy! A mash of nothing but roasted sweet potato makes a mean muffin and unexpectedly delicious topping for your morning toast. Spread over butter one morning and cream cheese another. Drizzle with maple syrup sometimes and honey other times. Add cinnamon always or never. There’s no way to get this wrong. In fact, if you ditch anything, it’ll be the toast—then you can stir some mash into your oatmeal. On Sunday night, while cooking dinner, wrap a bunch of sweet potatoes in aluminum foil and roast in a 400-degree oven until soft and oozing. Once cool, mash into a nutritionally dense spread that will keep in an airtight container in the fridge for 3-5 days. Adding vegetables to eggs is as surefire a way as I know to get the family to eat lots of veggies. I do this at lunch, dinner and, yes, even breakfast. Some classic veggie/egg/cheese combos include peppers, onion and cheddar; spinach, tomato and feta; asparagus and fontina; and zucchini and fresh ricotta (pictured above). All impossible to resist. It doesn’t get easier than this. Chop your favorite—or leftover—veggies and toss into whisked eggs with crumbled or shredded cheese. Make a scramble if you’re in a rush. Otherwise, take the time to make a frittata, which feels more dinner-y. Dark leafy greens rich in folate, iron, vitamins A, C and K are among the most nutritious of all vegetables and they happen to make great juice, too. Make a morning drink that’ll put your OJ to shame by balancing earthy greens with lots of fruit and also-good-for-you ginger. Kiddo not convinced? Call it zombie juice and watch your little monster drink up! If you have a very high power blender, put greens and fruit right in, plain (to make juice) or with ice and some low-fat vanilla yogurt to make a smoothie. Otherwise, juice your greens before blending up a smoothie. Kale, spinach and even romaine lettuce taste great with apples, ginger, oranges, grapes, mango, melon and/or pears. Check out our Green Smoothie recipe here– it’s kid-approved. Did you know that zucchini is a great source of vitamin C? And manganese, vitamin A, fiber and potassium. Wait, there’s more! It also provides an unusual amount of antioxidant nutrients (just be sure to eat the flesh and the skin). Not bad for a mild tasting veggie that works well in recipes from sweet to savory. I like having mini zucchini muffins in the freezer for on-the-go breakfasts, but when there’s more time, zucchini pancakes are hard to beat. Shred zucchini with a grater and squeeze dry in a kitchen towel. You may need to ring the towel more than once. 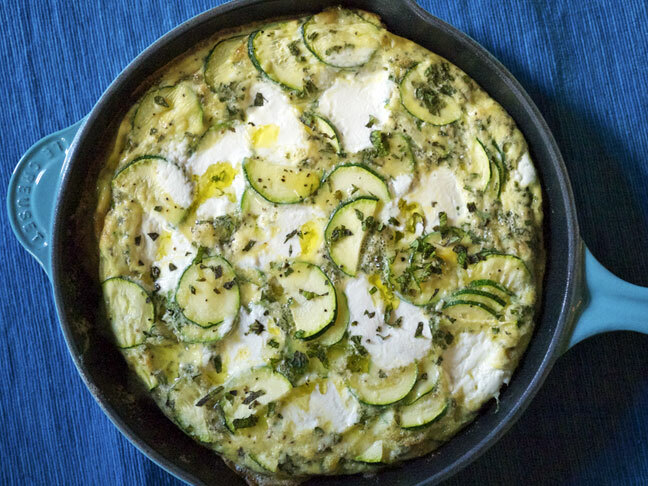 Stir prepped zucchini into your favorite pancake batter (try a lemon ricotta pancake recipe!). If it adds too much moisture and thins your batter, add a little bit more flour or mix. Cook batter as usual. Drizzle with maple syrup as usual. Eat as usual! Avocados are actually fruit, but a nutritional powerhouse nonetheless. Though rich in vitamins C, K and B6, fiber, potassium and folate, it’s their staggering array of phytonutrients that push avocados to the top of the good-for-you list. Avocado is an easy addition to a morning tropical fruit salad along with mango and pineapple (particularly delicious served with plain yogurt mixed with fresh lime juice and honey). Or, if you want to keep it savory, make a quick avocado salad to top your eggs. Dice peeled and pitted avocado into ¼“ chunks. Toss with your favorite salsa ingredients. For eggs, I like to keep it simple: chopped fresh tomato, red onion, cilantro, lime juice, salt and pepper. Use your salsa to top eggs cooked any style and serve with warm tortillas instead of toast and plain yogurt instead of sour cream. Okay, pumpkin is also a fruit, but also super nutritious! Its bright orange flesh is packed with antioxidants and cancer-fighting beta-carotene, which our bodies convert into vitamin A. I love that pumpkin is so easy to make sweet (hello pumpkin pie) or savory (pumpkin risotto is a favorite fall dish). But, surely, the best way to enjoy pumpkin at breakfast is with a smear of pumpkin butter on toast, a warm muffin or even waffles. There are lots of ways to make pumpkin butter, some complicated and others not. My favorite quick method? Place peeled 1” cubes of pumpkin in a pot and barely cover with apple cider (or, if you want to lower the sugar, a combo of cider and water). Cook until pumpkin is soft and puree. Return the puree to the pot; season with maple syrup, cinnamon and other spices (I like a little fresh ginger and nutmeg); and cook until thick and spreadable.